Beach front property set on 25 acres of picturesque Caribbean coast just a one and a half hour drive from Tocumen airport and an hour from Panama City, you will find Panamas premiere beachfront Bala Beach Resort. Positioned as the closest beachfront residential community to Panama City and the only residential resort development on the Caribbean coast. This luxury 2 bedroom fully furnished unit is perfect for a family or traveling couples and duos. Each bedroom boasts its own private bathroom with a spectacular 9th floor unobstructed view of the Caribbean ocean and beach, 10 foot floor to ceiling windows, balcony with sliding doors off the living room and master bedroom, design bamboo flooring throughout, stainless steel appliances, 5 burner gas range, ensuite laundry and all the amenities you would expect from home. Towels, beach towels and all linens provided. Guests and residents staying at Bala Beach Resort can enjoy the beautiful natural environment of the lush jungle and Caribbean coastline without sacrificing the comforts of home. Whether youre looking for an adventure or simply to slow down and relax. Now open the beachfront AKU restaurant, where you can sit back and relax with a cold one and enjoy a fresh cooked Caribbean meal. Bala Beach Resort offers many indoor and outdoor amenities to choose from. 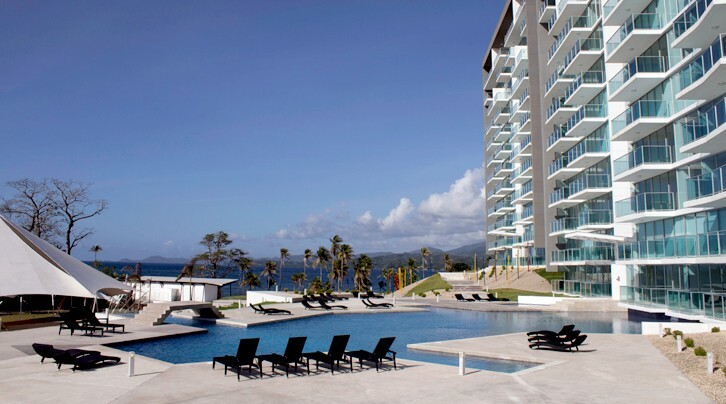 Large beautiful outdoor pool, a top of the line fully equipped gym, Granite Counter Tops, Modern Fixtures, Toilets, Sinks, Showers & Bath Tubs, Caribbean Ocean View Short Distance from the Restaurant and Beach Walkout Balconies, High Speed Internet Ready. A 10 minute walk to the pretty little village of Maria Chiquita, where you pass thru to get to Bala beach, carries all your basic items. The town of Sabanitas is a 25 minute drive for all items needed for your bigger grocery purchase, two main supermarkets, Rey''s and Super 99. Local taxis are always available just outside of Maria Chiquita if needed. Recommended places to visit and tours, Portobelo, Panama Canal, Casco Viejo (Old Panama City) a must see, Amador Causeway, San Blas Islands, Bocas del Toros, El Valle de Antón, Gamboa rainforests, Isla Grande, just to list a few. Prefer at least a monthly minimum stay and am also open to a short or long term lease to working professionals. Prices based on double occupancy, please state otherwise!! For Sale $199,000.00 fully furnished turn key sale! An expat retired in Nueva Gorgona, Panama wrote an extensive report about her experiences there. Everything from cost of living, housing, safety, how it feels to retire abroad, transportation and more are covered. A definite must read for anyone considering retiring in Panama! An expat who moved to Boquete, Panama talks advises newcomers to find a short-term rental to have time to explore without committing to one place. She has found that rental prices in Boquete are about a fourth of what they are in the US.